October marks the beginning of the last four weeks of first quarter. Stay strong! We will complete our study of one-dimensional motion by exploring free fall . This will include doing assignment 4 together in class and running some simulations. Once we are done, we will take the unit 1 test and will then start unit 2 on two-dimensional motion. When announced, please take notes on unit 2’s VIDEO 1: Introduction to Vector Operations. Baby sloths make the CUTEST sounds. Like, seriously. They’re basically squeak toys. Check out this sweet video from the Sloth Sanctuary of Costa Rica, which focuses on the rescue, rehabilitation and research of sloths as well as conserving their rainforest habitat. The end of this week marks the interim of first quarter. Please check PowerSchool to make sure your grade is where you want it to be as you strive for excellence! Hey, did you hear that the BROWNS WON??? I don’t know about you, but I loved seeing the spiral on the ball of Baker Mayfield’s amazing passes. Why do quarterbacks put spin on the ball? Physics, of course! FUN FACT: The photographer who took the picture below is a friend of your teacher’s family! We will complete our projectile experiment in class on Monday and will also begin Newtonian Mechanics unit 3 on mass, force, and Newton’s laws. We’ll focus first on the study of force, mass, and gravity, and our studies will include practice problems and an experiment on Inertial Mass vs Gravitational Mass. Homework 1 will be due during this week. By the end of the week we will begin exploring Newton’s laws of motion. This is a longer unit, so we will not be testing until the week after next. We will continue to explore acceleration, which was covered in VIDEO 3: Acceleration, which you should have already taken notes from. We will do more hands-on activities and will complete assignment 2 together in class, followed by a quiz over goal set 3 when announced. When assigned, please take notes on the final lecture for this unit, VIDEO 4: Kinematics and Free Fall. 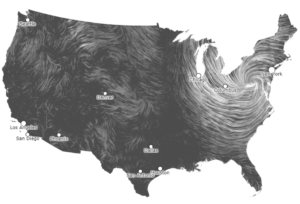 As we sadly watch the trauma unfold in the Carolinas this weekend due to Hurricane Florence, you might be interested in a very mesmerizing and informative website that allows you to watch wind currents over the continental U.S. in real time. Check it out! The above image is an archival one of October 30, 2012’s Hurricane Sandy, which you may remember having a major impact here in Avon Lake, causing power outages for many days as the winds came over Lake Erie. On Monday homework 1 from unit 2 is due. During the week we will finish unit 2 by completing notes, doing a second problem packet in class, completing homework 2 from unit 2 at home (due Wednesday), and running a projectile experiment in class. Test the following week! Woot! On Monday we will (continue to) work on Assignment Fun 1 together in class. (It is not homework for the weekend.) When we are done with that you will do goal set 2 for homework (as announced, likely due Tuesday) followed by a quiz over goal sets 1 & 2. When announced please take notes over VIDEO 3: Acceleration. We will do various activities about acceleration in class followed by another assignment. Bruce the vegetarian shark may be more real than we thought! Scientists have recently discovered that bonnethead sharks eat sea grass in addition to preying on critters, making them the first species of shark to be reclassified as omnivores instead of carnivores. Baby shark!